About a year ago Zach and I drove home after our traditional Tuolumne river trip and talked about our plans. As always I pressed him with my idea of running rivers in Siberia. Zach was probably tired after our trip or just relaxed before the dinner with some vodka in my house because suddenly he gave up and told me to choose the river to do. It did not take a long time to choose the Kaa-Khem River. I ran the river in 1986 with a group of my good friends and my daughter, a high school student at the time. The river left me with sense of happiness. Everything was good: beautiful landscapes, clean water, good weather, fishing, cedar nuts, berries and mushrooms, lack of mosquito and flies, long conversations with friends around the campfire. The rapids were not scary but enjoyable and we ran the river lazily and happily. I wanted to come back to see and feel it again. 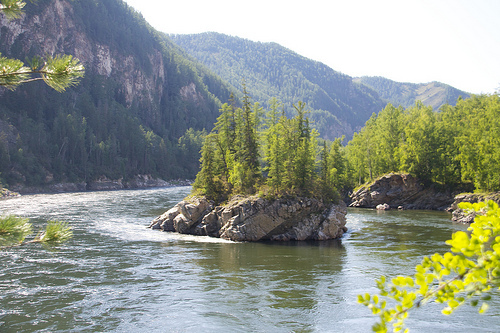 The Kaa-Khem is one of main sources of one of the biggest rivers in the world, the Yenisey, and runs among southern ranges of Sayan mountains in the Tuva republic of Russia. Some Americans know about Tuva and Tuvans because of their unique throat singing. The region was not always accessible because of its remoteness. Twenty five years ago we camped in the Kyzyl airport for three days waiting for good weather to fly to the river. But at least in those days we could fly to Tuva’s capital directly from Moscow. In modern Russia it is practically impossible – there is only one small 8-seater flying from the big Siberian city of Krasnoyarsk to Kyzyl once per day. These flights it would make our trip very expensive. Prices are so high that people can’t afford to fly and therefore many flights that existed before are cancelled now. The 4-5 hour long flight from Moscow to Siberia cost 2-3 times more then flights from California to East coast. 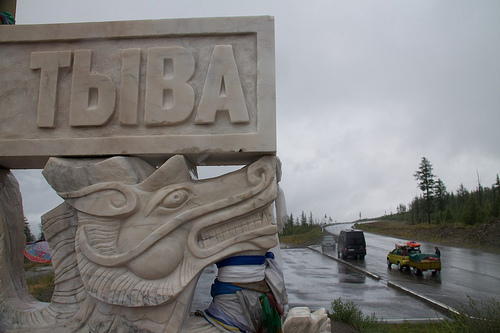 So we flew to Abakan City and from there we drove to Kyzyl along one of two roads that connect Tuva with rest of the world. The good road (on Russian scale) winds between beautiful green ranges of the Sayan Mountains. There are some small eateries along the road where traveler can get inexpensive simple but tasty food. Kyzyl did not look dusty like it did 25 years ago (but maybe it is because it was rainy). On the corner of two major streets two drunk young Tuvans beat c… of each other – nothing changed during 25 years. To be fair there are some restaurants in Kyzyl now with good food (they were completely absent in Soviet times) and you can even buy German and Belgium beer! 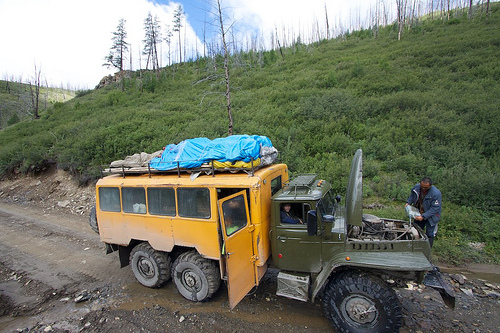 We left our Ford van and loaded up into famous Russian military truck “Ural”. This monster can run even bad roads (on Russian scale) or lack of them. It took 1.5 days to reach the river near the Tuvan settlement of Kungurtug. Our Tuvan driver Sergey stopped at a million places to pick up something or somebody, just to talk, or to add water to radiator. Between stops he drove like crazy along muddy road, crossing creeks, rivers (some of them were covered with ice). Eventually we found ourselves crossing a pretty big river toward a big glade that became our Put-in. Our group had Zach and me as American guides, Anatoly, Lena, and Stas as our Russian partners-guides and 9 guests – 5 Americans (among them Larry whose company on many rivers I enjoy for 10 years), a “crazy” Italian, and three Russians. Two Russian guides were taking down traditional 4-person cat with two guests, Zach was responsible for all our supplies loaded in a gear raft, and I had 6 people in a paddle boat. Anatoly was our safety kayaker. Our first river day was very long. The fast current carried us through a densely forested area. We passed about 30 miles and stopped at the Saryg-Er river mouth. 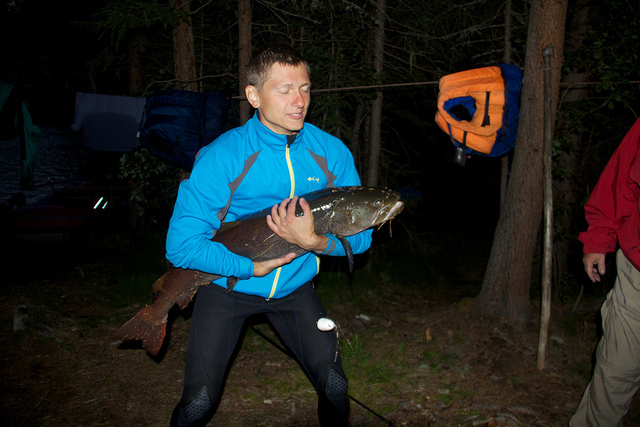 In less than half an hour Sasha caught something incredibly huge that he could pull to the shore only with help of Anatoly who jumped into the river. The fish was an exotic Siberian fresh water relative of salmon named “taimen” about 4ft long. We spend the rest of the evening preparing and eating of “uha” from its head, fried taimen, and drinking vodka (we are in Siberia!). Even without rapids Kaa-khem was not boring. Landscapes were beautiful, water clean. We grazed on berries in taiga and picked up some mushrooms. 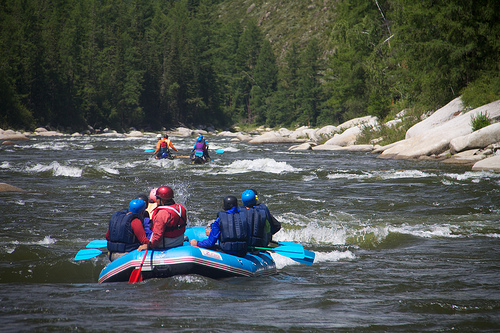 On third day we reached our first rapids – so called Mel’zey cascade. Some rapids were challenging and exciting. The water in one of the rapids was strong enough to break the frame of Russian cat. Our guests and Zach were amazed at how fast Russian guides fixed it with a piece of wood. We will remember the camp at Mel’zey river mouth as best place for fishing: our guests caught many greylings and lenoks (rainbow trout). Actually we had fresh fish at every dinner. Before our next serious cascade of rapids – 7mi long canyon “Cheeks” we visited a tiny village of “old believers” – religious refugees whose roots are in the time of Peter the Great. They moved away from civilization to live a very simple life. The men even did not talk to us. All of them had waist long beards and continued their everyday business. There are only 7 families in the village but each family is 10 people in average. They are busy in long Siberian winters also! The “Cheek” canyon is a great intense series of rapids. It was fun to run them and it is almost impossible to scout the rapids of this canyon. Soon after the Cheeks Canyon the Kaa-Khem is joined by another big river – the Kyzyl-Khem. There is a stunningly beautiful campsite at the confluence. A few miles downstream we stopped for a lay-over day. Anatoly built a great Siberian sauna. Everyone made several rounds to hot steamy “banya” with whipping from birch wigs and diving to cold Kaa-Khem. After it and shot of vodka you feel like born again Russian. We ran Kaa-Khem for three more days. Now it is a very big river. Still there are some good rapids, very picturesque landscapes, a bear on the shore. In other words – everything that you may expect in Siberia but no mosquitos! Our van picked us up at Ust’ Buren village. We had a short stop in Kyzyl and took photos at the Center of Asia monument vbefore leaving Tuva. Siberia is bigger than the USA and we only saw a tiny piece of it. Everyone wants to see more. Zach is already studying Russian for our return. We are ready to go.